This module is intended for experienced forecasters shifting from duties over a land-based area to a coastal or Great Lakes region where both over-land and over-water forecast areas exist. This module highlights the differences between marine boundary layer and terrestrial boundary layer winds. The experienced forecaster is relatively familiar with the boundary layer over land and the associated implications for the wind field. Using this as a base, the module compares this known quantity with the lesser-known processes that occur in the marine boundary layer. Three major topics that influence marine boundary layer winds are discussed: stability within the boundary layer, isallobaric influence, and the effects of convection and tropical cyclones. Good information, but very long winded and a little dry. Could use more graphics. Otherwise, great lesson. This was a nice complement for the research that I am currently conducting. A lot of the material reinforced my current knowledge, while aiding me in topics I was not well versed in. I would recommend a basic forecasting module to start with first, and in addition, a brush up on Boundary Layer Physics. Overall assessment: Not bad. This last part is the most difficult if you are not familiar with metheorology! so for people with no metheorological background this is heavy stuff! The module covered a lot of information that is fairly complex, but I thought a significant portion of it seemed superficially and tersely addressed. It seems that the focus was to cover a lot of ground, but due to the subtleties of each area and the way it was organized, it became confusing. There seemed to be too much information in too little space. The focus of the module seemed to shift often, making it difficult to determine what the take-home messages of some sections were. I am a novice, so my comments may be due to lack of the underlying knowledge and background of the field, though it seemed like additional modules added to the course prior to this module would have been helpful. Highlight the major differences between boundary-layer winds in the marine and over-land environments. Examine surface wind differences in stable and unstable boundary layers. Examine how the stability profile changes seasonally and diurnally. Assess the impact of isallobaric wind effects in a marine setting. Identify the main impacts of severe convection on marine winds. 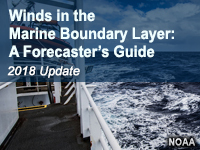 Recognize known model biases in predicting marine boundary layer winds and what situations require the forecaster to make adjustments. March 2012: This module has been updated to provide greater flexibility in navigation and linking to specific content. In addition, minor changes have been made to improve the clarity of the content and correct inconsistencies. However, these changes do not affect the overall substance of the material taught. September 2018: Updates include the addition of GOES-16 satellite imagery to help illustrate key marine boundary layer processes. Minor changes to address some outdated content were also completed and the module was reprogrammed in a current template not reliant on Flash technology.